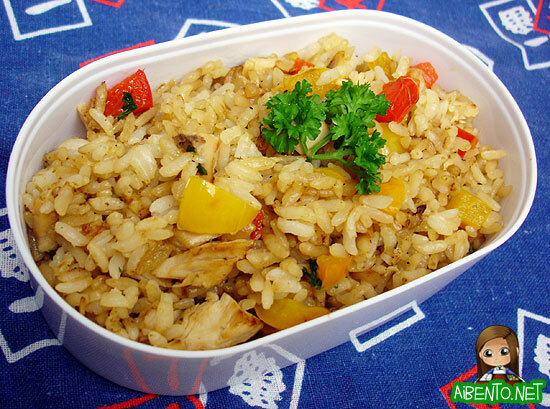 Today’s bento is simple Costco Fried Rice, which I cooked this morning with bell peppers, sweet onion, and parsley. Buddy claimed he wanted some for breakfast, but it turned out he just wanted to fling it all over the kitchen when I was using the bathroom. Little twerp!! I’ve only brought a small bento today since I’ve got this Costco thing of cashews to nibble on in addition to an orange and a bosc pear. This weekend was the homecoming game for the UH Football team and what a fun game it was. We won 50-13 and it was windy, making for great confetti entertainment, plus it rained so Baby Girl was thrilled to use her poncho. We’re ranked 14 in the BCS poll, which is of course going to make for 2 long weeks of speculation by UH fans until the Fresno State game in November. I’ll be at Fan Fest when Hawaii goes away to their last road game in Nevada. I will have to find some way to watch that game! We went pumpkin picking yesterday at Aloun Farms in Ewa and boy was that a dirty affair. It was completely dry and the dirt flew everywhere, but mostly into my poor contact covered eyes. I was crying almost the whole time and whenever I could manage to open my eyes again, more dirt would fly in. I’m amazed I didn’t come home with a rotten pumpkin. The kids loved it, which was really cute. I told them to enjoy having so much dirt on them because that was probably the only time all year Mr. Pikko would let them get so filthy.